Klebsiella oxytoca (K. oxytoca) is a Gram-negative microbe generally associated with community and hospital-acquired infections. Due to its clinical significance, we evaluated the effect of biofield treatment on phenotype and biotype characteristics of K. oxytoca (ATCC 43165). The study was performed into three groups i.e. C (control), T1 (treatment, revived); and T2 (treatment, lyophilized). Subsequently, groups T1 and T2 were received biofield treatment and control group was remained as untreated. The antimicrobial sensitivity results showed 3.33% and 6.67% alteration in antimicrobials susceptibility in group T1 cells on day 5 and 10, respectively, and 3.33% alteration in antimicrobials susceptibility was observed in group T2 cells on day 10 as compared to control. The sensitivity patterns of cefazolin were changed from resistant (R) to intermediate (I) on day 5, and resistance (R) to susceptible (S) on day 10, in T1 cells of K. oxytoca. The MIC value of cefazolin was decreased by 2-fold in group T1 on day 10 as compared to control. The biofield treated K. oxytoca exhibited the changes in biochemical reactions about 3.03% and 15.15% of total tested biochemicals in group T1 cells on day 5 and 10, respectively as compared to control. The biotype number of K. oxytoca was altered in biofield treated group and organism identified as Raoultella ornithinolytica in T1 on day 10 as compared to control, which is the prominent finding of this study. These changes were found in treated bacteria that might be due to some alteration happened in metabolic/enzymatic pathway and/or at genetic level of K. oxytoca. Based on these data, it is speculated that biofiled treatment could be an alternative approach that can improve the effectiveness of the existing antimicrobials against the resistant pathogens. Microorganisms like bacteria, viruses, fungi, and parasites are continuously acquiring the resistance against existing antimicrobials that possess a major global threat to public health. In the latest report of World Health Organization (WHO) warned to the occurrence of post-antibiotic era, where people will die from simple microbial infections due to ineffectiveness of current antimicrobials. Frequent and improper use of antimicrobial further accelerated the incidence of microbial resistance [1,2]. Klebsiella oxytoca (K. oxytoca) is a rod-shaped, nonmotile, Gram-negative bacterium with a prominent polysaccharide capsule, which provides a resistance against host defense mechanisms. Klebsiella species are normally associated with the community and hospital-acquired infections particularly in immunocompromised patients. The patients having prostatectomies, neurosurgical procedures, intravascular catheters, colonoscopies, platelet transfusions, urinary tract infections (UTI), and pre-existing viral or antibiotic induced colitis are more prone to K. oxytoca infection . K. oxytoca has developing the enzymes extended spectrum β-lactamases (ESBL) and carbapenemases that lead to bacterial resistance to β-lactam antibiotics. Therefore, K. oxytoca is usually resistant to some antibiotics like cefotaxime, ceftazidime and aztreonam [4,5]. Recently, biofield treatment is reported for the alteration in sensitivity of antimicrobials against the tested microorganism . The conversion of mass into energy is well known in literature for hundreds of years that was further explained by Fritz  and Einstein . The energy can exist in various forms like kinetic, potential, electrical, magnetic, and nuclear; and can be produced from different sources. Correspondingly, the nervous system of human also consists of neurons that have the ability to transmit information in the form of electrical signals [9-11]. Thus, human has the ability to harness the energy from environment or universe and can transmit into any living or nonliving object(s) around the globe. The objects always receive the energy and responding into useful way that is called biofield energy and the process is known as biofield treatment. Mr. Trivedi’s biofield treatment is well-known to change the various physicochemical characteristics of metals and ceramics [12-14]. The quality and yield of several agriculture products have also been improved with several folds in the biofield treated plants . Exposure to biofield energy caused an increase in growth and anatomical characteristics of plant . Further, the biofield treatment has considerably altered susceptibility of antimicrobials and biotype number of microbe [6,17,18]. By conceiving the above mentioned facts and literature reports on biofield, the present work was undertaken to evaluate the impact of biofield treatment on antimicrobials susceptibility, biochemical reactions pattern, and biotype of K. oxytoca. Two lyophilized vials of K. oxytoca [American Type Culture Collection (ATCC) 43165] were procured from MicroBioLogics, Inc., USA. These vials were stored as per the suggested storage conditions till the further use. The antimicrobials susceptibility study, biochemical reactions patterns, and biotype number were evaluated on MicroScan Walk-Away® (Dade Behring Inc., West Sacramento, CA) using Negative Breakpoint Combo 30 (NBPC30) panel . The antimicrobials and biochemicals used in the study were procured from Sigma-Aldrich. The lyophilized cells of K. oxytoca were divided into three groups: C (control), T1 (treatment, revived) and T2 (treatment, lyophilized). The treatment groups (T1 and T2) were in sealed pack and handed over to Mr. Trivedi for biofield treatment under laboratory condition. Mr. Trivedi provided the treatment through his energy transmission process to the treated groups without touching the samples. Subsequently, groups C and T1 were assessed on day 5 and 10, and group T2 was assessed on day 10, for the antimicrobial sensitivity, biochemical reactions, and biotype number. The antimicrobial susceptibility study was carried out on MicroScan Walk-Away® using negative breakpoint combo 30 (NBPC30) panel, as per manufacturer's instructions. Briefly, the standardized suspension of K. oxytoca were inoculated, rehydrated, and then subjected to incubation for 16 h at 35°C. After that, the susceptibility pattern like susceptible (S), intermediate (I) or resistant (R); and quantitative susceptibility in terms of minimum inhibitory concentration (MIC) were determined by observing the lowest antimicrobial concentration showing growth inhibition [20-22]. 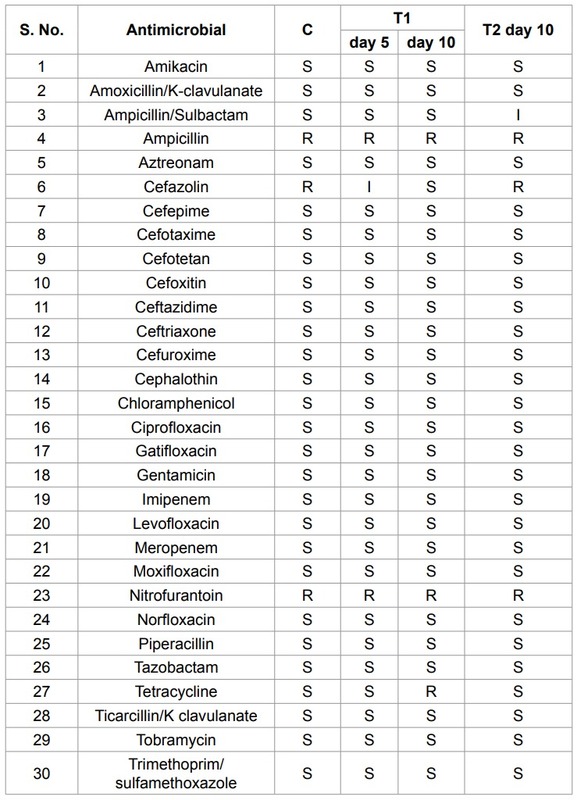 The antimicrobials used for the sensitivity study were amikacin, amoxicillin/K-clavulanate, ampicillin/sulbactam, ampicillin, aztreonam, cefazolin, cefepime, cefotaxime, cefotetan, cefoxitin, ceftazidime, ceftriaxone, cefuroxime, cephalothin, chloramphenicol, ciprofloxacin, gatifloxacin, gentamicin, imipenem, levofloxacin, meropenem, moxifloxacin, nitrofurantoin, norfloxacin, piperacillin, tazobactam, tetracycline, ticarcillin/K- clavulanate, tobramycin, and trimethoprim/sulfamethoxazole. The study of biochemical reactions was carried out on MicroScan Walk-Away® system . The biochemicals used in present work were acetamide, adonitol, arabinose, arginine, cetrimide, cephalothin, citrate, colistin, esculin hydrolysis, nitrofurantoin, glucose, hydrogen sulfide, indole, inositol, kanamycin, lysine, malonate, melibiose, nitrate, oxidation-fermentation, galactosidase, ornithine, oxidase, penicillin, raffinose, rhaminose, sorbitol, sucrose, tartarate, tryptophan deaminase, tobramycin, urea and Voges-Proskauer. The results of antimicrobial susceptibility study and MIC values are summarized in Table 1 and 2, respectively. The results showed about 3.33% and 6.67% alteration in antimicrobials susceptibility in group T1 cells on day 5 and 10, respectively, and 3.33% alteration in antimicrobials susceptibility was found in group T2 cells on day 10 as compared to control. Concisely, the K. oxytoca was converted from S → I against ampicillin/sulbactam in T2 cells on day 10; and R → I and S against cefazolin in T1 cells on day 5 and 10, respectively. The K. oxytoca showed an alteration from S → R against tetracycline in T1 cells on day 10. The MIC data suggested about 2-folds decrease in MIC value of cefazolin, and more than 2-folds increase in MIC value of tetracycline in T1 cells of K. oxytoca on day 10, as compared to control. 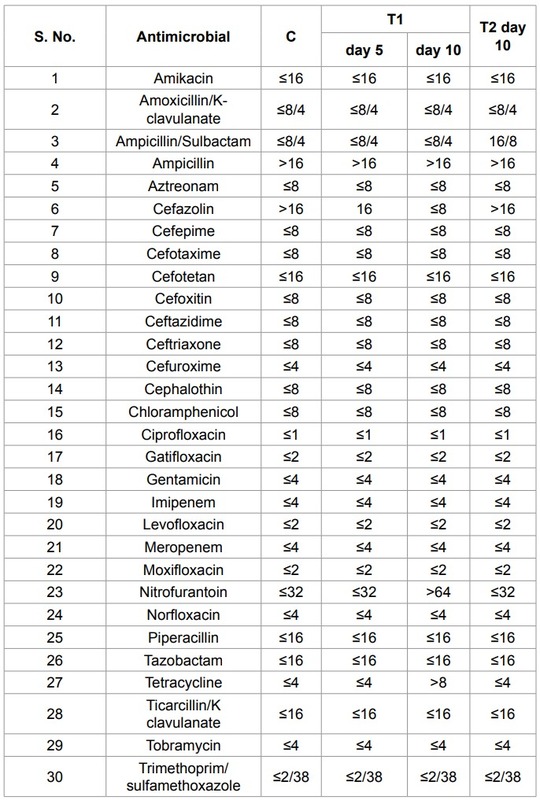 Furthermore, the susceptibility pattern of K. oxytoca to ampicillin/sulbactam was also changed from S → I in T2 cell on day 10 with about 2-folds increase in MIC value as compared to control (Table 2). 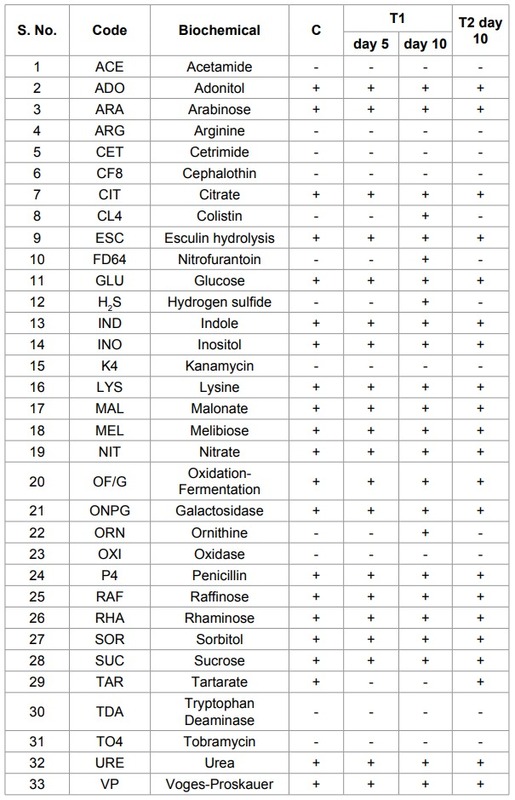 The biochemical reactions data are shown in Table 3. K. oxytoca exhibited an alteration in biochemical reactions about 3.03% and 15.15% of total tested biochemicals on day 5 and 10, respectively. The colistin, nitrofurantoin, hydrogen sulfide, and ornithine were converted from negative (–) to positive (+) reaction in group T1 on day 10, and tartarate was converted from positive (+) to negative (–) reaction in group T1 on both day 5 and 10. The results showed no change in biochemical reactions patterns of group T2 cells, as compared to control (Table 3). Table 1: Effect of biofield treatment on K. oxytoca to antimicrobial susceptibility. Table 2: Effect of biofield treatment on K. oxytoca to minimum inhibitory concentration (MIC) of tested antimicrobial. Biotype number of K. oxytoca was determined on MicroScan Walk-Away® processed panel, using biochemical reactions data. The result demonstrated an alteration in biotype number of K. oxytoca in group T1 on day 10, as compared to control. The change in the species from K. oxytoca to Raoultella ornithinolytica (formerly known as Klebsiella ornithinolytica) was also found in group T1 on day 10 (Table 4), which describes the most significant impact of biofield treatment in this study. Antimicrobial resistance in several microbes has been increased vigorously in recent time. Generally, microorganisms mutate and finally become resistant to antibiotics. Unfortunately, due to improper or misuse of antimicrobials the incidences of antimicrobial resistance in microbes are observing in faster rate than expected . As a result, discovery of antimicrobial drug therapy is a slow and time-consuming process. Recently, there are reports wherein, the susceptibility of microbe was altered from resistance to susceptible or inversely using the biofield treatment [17,18]. Therefore, present work investigates the effect of biofield treatment on K. oxytoca, and evaluated its impact on susceptibility and biochemical reactions pattern to the selected antimicrobials and biochemicals. Table 3: Effect of biofield treatment on K. oxytoca to biochemical reactions. Table 4: Effect of biofield treatment on K. oxytoca to biotype number. from susceptible to intermediate or resistant to a few antimicrobials. The MIC values of some antimicrobials were also altered accordingly to changes in sensitivity patterns of K. oxytoca. Overall, the result of present study indicated that biofield treatment has the ability to alter the susceptibility of microbes in both direction either susceptible to resistant or resistant to susceptible. Biochemical methods employed to identify or classify the bacterial species based on their biochemical reactions. Several biochemical tests like indole production, ornithine decarboxylation, and carbon substrate assimilation tests have been reported in literature for the identification of K. oxytoca. It usually exhibited the positive reactions to indole, malonate, urease, Voges-Proskauer; and negative reactions to arginine, colistin, hydrogen sulfide, and ornithin . Similar reactions patterns were also observed in this study for control sample of K. oxytoca. However, after biofield treatment some biochemical reactions pattern were altered like ornithine, hydrogen sulfide, colistin etc. These biochemical were changed from negative to positive reactions in group T1 on day 10. As well, tartarate was converted from positive to negative reaction in group T1 on both day 5 and 10. These data suggested the impact of biofield treatment on metabolic pathway of K. oxytoca. Alterations in biochemical reactions were attributed to changes in biotype number of K. oxytoca that was found in group T1 on day 10. Wherein the biotype number and species were altogether changed and the new species was identified as R. ornithinolytica. Overall data conclude that there was an alteration in antimicrobial sensitivity, biochemical reactions patterns, and biotype number of biofield treated K. oxytoca. These results depicted that biofield treatment has the ability to make some alteration at the enzymatic or metabolic pathway and/or at genetic level of K. oxytoca. Therefore, in future the biofield treatment could be useful as an alternative method to prevent the infections of pathogenic microbes. 2. WHO (2014) WHO’s first global report on antibiotic resistance reveals serious, worldwide threat to public health. 3. Hori K Yasoshima H, Yamada A, Sakurai K, Ohkubo E, et al. (1998) Adrenal hemorrhage associated with Klebsiella oxytoca bacteremia. Intern Med 37: 990-994. 4. Wu SW, Dornbusch K, Göransson E, Ransjö U, Kronvall G (1991) Characterization of Klebsiella oxytoca septicaemia isolates resistant to aztreonam and cefuroxime. J Antimicrob Chemother 28: 389-397. 5. Nathisuwan S, Burgess DS, Lewis JS 2nd (2001) Extended-spectrum beta-lactamases: epidemiology, detection, and treatment. Pharmacotherapy 21: 920-928. 6. Trivedi MK, Bhardwaj Y, Patil S, Shettigar H, Bulbule, A (2009) Impact of an external energy on Enterococcus faecalis [ATCC-51299] in relation to antibiotic susceptibility and biochemical reactions-an experimental study. J Accord Integr Med 5: 119-130. 7. Hasenohrl F (1904) On the Theory of Radiation in Moving Bodies. Ann Phys 320: 344-370. 9. Becker RO, Selden G (1985) William Morrow and Company. The body electric: electromagnetism and the foundation of life, New York, USA. 12. Trivedi MK, Tallapragada RR (2009) Effect of superconsciousness external energy on atomic, crystalline and powder characteristics of carbon allotrope powders. Mater Res Innov 13: 473-480. 13. Trivedi MK, Patil S, Tallapragada RM (2014) Atomic, crystalline and powder characteristics of treated zirconia and silica powders. J Material Sci Eng 3: 144. 14. Trivedi MK, Patil S, Tallapragada RM (2013) Effect of biofield treatment on the physical and thermal characteristics of vanadium pentoxide powders. J Material Sci Eng S11: 001. 15. Lenssen AW (2013) Biofield and fungicide seed treatment influences on soybean productivity, seed quality and weed community. Agricultural Journal 8: 138-143. 16. Patil SA, Nayak GB, Barve SS, Tembe RP, Khan RR (2012) Impact of biofield treatment on growth and anatomical characteristics of Pogostemon cablin (Benth). Biotechnology 11: 154-162. 17. Trivedi MK, Patil S (2008) Impact of an external energy on Yersinia enterocolitica [ATCC-23715] in relation to antibiotic susceptibility and biochemical reactions: an experimental study. Internet J Alternat Med 6. 18. Trivedi MK, Patil S (2008) Impact of an external energy on Staphylococcus epidermis [ATCC-13518] in relation to antibiotic susceptibility and biochemical reactions-an experimental study. J Accord Integr Med 4: 230-235. 19. Overman TL, Janda JM (1999) Antimicrobial susceptibility patterns of Aeromonas jandaei, A. schubertii, A. trota, and A. veronii biotype veronii. J Clin Microbiol 37: 706-708. 20. Fader RC, Weaver E, Fossett R, Toyras M, Vanderlaan J, et al. (2013) Multilaboratory study of the biomic automated well-reading instrument versus MicroScan WalkAway for reading MicroScan antimicrobial susceptibility and identification panels. J Clin Microbiol 51: 1548-1554. 21. Gomaa FM, Tawakol WM, Abo El-Azm FI (2014) Phenotypic and genotypic detection of some antimicrobial resistance mechanisms among multidrug-resistant Acinetobacter baumannii isolated from immunocompromised patients in Egypt. Egypt J Med Microbiol 23: 99-111. 22. Hansen DS, Aucken HM, Abiola T, Podschun R (2004) Recommended test panel for differentiation of Klebsiella species on the basis of a trilateral interlaboratory evaluation of 18 biochemical tests. J Clin Microbiol 42: 3665-3669. 23. Sader HS, Fritsche TR, Jones RN (2006) Accuracy of three automated systems (MicroScan WalkAway, VITEK, and VITEK 2) for susceptibility testing of Pseudomonas aeruginosa against five broad-spectrum beta-lactam agents. J Clin Microbiol 44: 1101-1104. 24. Chen Z, Jiang X (2014) Microbiological safety of chicken litter or chicken litter-based organic fertilizers: a review. Agriculture 4: 1-29. 25. Fenosa A, Fusté E, Ruiz L, Veiga-Crespo P, Vinuesa T, et al. (2009) Role of TolC in Klebsiella oxytoca resistance to antibiotics. J Antimicrob Chemother 63: 668-674. 26. Yigit H, Queenan AM, Rasheed JK, Biddle JW, Domenech-Sanchez A, et al. (2003) Carbapenem-resistant strain of Klebsiella oxytoca harboring carbapenem-hydrolyzing beta-lactamase KPC-2. Antimicrob Agents Chemother 47: 3881-3889. 27. Alves MS, Dias RC, de Castro AC, Riley LW, Moreira BM (2006) Identification of clinical isolates of indole-positive and indole-negative Klebsiella spp. J Clin Microbiol 44: 3640-3646. 28. Stock I, Wiedemann B (2001) Natural antibiotic susceptibility of Klebsiella pneumoniae, K. oxytoca, K. planticola, K. ornithinolytica and K. terrigena strains. J Med Microbiol 50: 396-406.